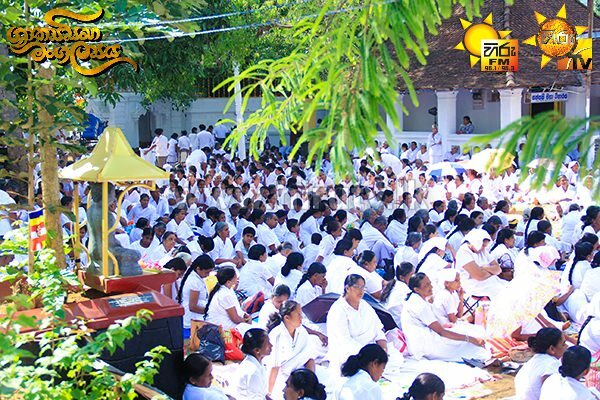 The special Shakyasinha Mangalya organized by Hiru TV and Hiru FM to commemorate the Vesak Poya Day commenced at the Muthiyangana Raja Maha Viharaya this morning. The Shakyasinha Mangalya was organized by giving priority to Amisa and Prathipaththi puja. A total of 100, 000 lamps will be lit and the Muthiyangana Chaithya is to be electrically lit up in 6 colours this evening under the patronage of the Chairman of Asia Broadcasting Corporation Mr. Rayynor Silva. Similarly the HIRU Uththama Dhathu Wandana programme is scheduled to begin tomorrow. A special enclosure for placing the sacred relics has already been built at the location. Chief Incumbent of the Muthiyangana Raja Maha Viharaya, Maha Nayaka Thera of the Asgiri Chapter Most Venerable Warakagoda Gnanissara Thera invited devotees to be a part of these religious observances. HIRU has taken steps to provide all necessary facilities to devotees arriving at the premises from all parts of the island. Meanwhile, Badulla District Secretary Nimal Abeysiri also stated that this was a rare opportunity for devotees.